Cloudy skies. High near 50F. Winds NE at 5 to 10 mph.. Rain showers this evening with overcast skies overnight. Low 39F. Winds E at 5 to 10 mph. Chance of rain 40%. Gold Camp Victorian Society member Richard Tremayne during a past Mt. Pisgah Speaks event. One of the group’s most popular events, Mt. Pisgah Speaks takes place in mid-September, with GCVS members telling the tales of their historic characters at Mt. Pisgah Cemetery. Members of the Gold Camp Victorian Society walk in the Victor Gold Rush Days, which began in 1895 as the “World Celebration” to commemorate Victor’s incorporation as a city in 1894. The celebration honors Victor C. Adams, one of the city’s original settlers, and the man it was named after. Gold Camp Victorian Society members Susan Johnson, Lorie Brubaker, Richard Tremayne and Joyce Smith are decked in their Victorian-era best during a Pearl’s Follies event, an annual event which raises funds for The Old Homestead House Museum. The Gold Camp Victorian Society, formed in 1999 with the intent to preserve the history of Cripple Creek, Victor and surrounding areas, hosts Victorian Tea events like this one, giving participants a taste of what life in Victorian-era Cripple Creek and Victor may have been like. Gold Camp Victorian Society members Howard Melching, Susan Johnson, Joyce Smith, Diana Melching, Margaret and Jim Rogers, and David Johnson during an Ambience Walk. The group and its activities support ongoing efforts to preserve the historical culture of Cripple Creek and Victor, as well as provide a late 19th- and early 20th century ambience to various city events. 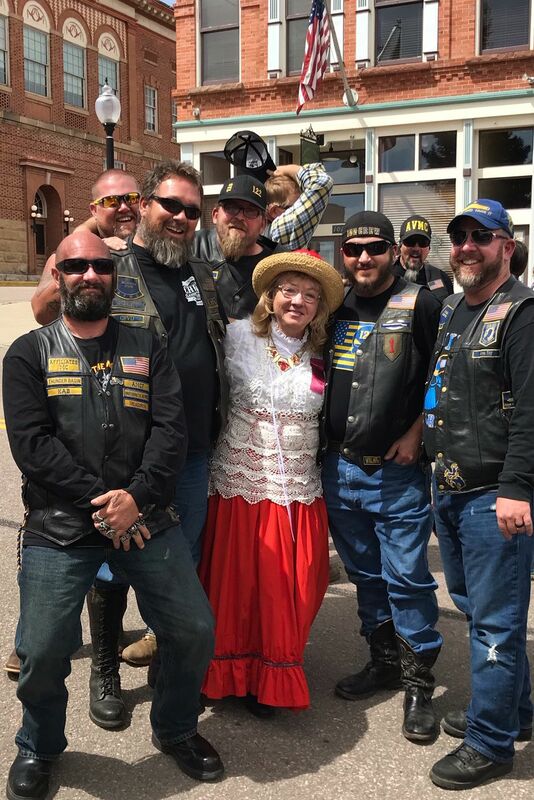 Dressed in her Victorian best, Gold Camp Victorian Society’s Kathy Collins poses with veterans during the annual Salute to American Veterans Rally, which honors the memories and legacies of fallen troops as well as honors all living veterans and active duty military members. It is Colorado’s largest procession of motorcycles, starting in Woodland Park and ending in Cripple Creek. Gold Camp Victorian Society members Howard Melching, David Johnson and Jay Ridge perform at the Jail Museum in Cripple Creek during the Historical Trolley Tour of Gold Camp. The Trolley Tour event is an interactive tour abroad a Cripple Creek trolley that provides a comprehensive look into the history of Cripple Creek and Victor. It also provides an insider’s look to gold mining, past and present. Viewers can watch inmates escape from the Jail Museum, or men sneaking away from the Old Homestead House. Gold Camp Victorian Society members Larry Meyer and David Johnson tell their character tales during the Mt. Pisgah Speaks event in September. Gold Camp Victorian Society members help make Christmas in Cripple Creek a truly memorable occasion. Gary Mezack, Joyce Smith, Richard Tremayne, and Susan and David Johnson at the Aspen Mine Center during Christmas festivities. Known as the “World’s Greatest Gold Camp,” the Cripple Creek and Victor Mining District has its roots in ranching, mining and railroad history beginning in the 1890s. Local residents have devised a unique approach to retaining that history through dressing in the accouterments and participating in the cultural recreation of the Western, Victorian and Edwardian periods. In 1999, 100 years following, the Gold Camp Victorian Society was formed to facilitate the preservation of the historic culture of Cripple Creek and Victor. Celebrating its 20th anniversary this year, the GCVS continues its mission to safeguard the heritage of the lifestyles and accomplishments of the early day residents who settled and enriched the community. “It started out with other ladies and myself who thought it would be fun to dress up and go around town in vintage clothing,” founding member Kathi Pilcher said. The society has now grown to a membership of approximately 80 people from “all walks of life in all stages of life,” says President Howard Melching. The group later organized to present historic programs about the area, researching and performing characterizations of notable personages who were instrumental in the area’s formation and development. Through research of individual lives and customs from more than a century ago, GCVS activities support ongoing efforts to preserve the area’s historical culture, performing and presenting educational programs and by providing ambience to numerous festivals and events. Historic re-enactments of notable personalities include mining magnates Winfield Scott Stratton and Albert E. Carlton, Johnny Nolan, Bob Wommack, Doc Susie Anderson, Author Mabel Barbee Lee, Mollie O’Brian, and Pearl DeVere, Colorado’s most beloved madam. There is a characterization for everybody with sheriffs and gunslingers, proper ladies and ladies of the evening, miners, ranchers, saloon keepers, shopkeepers, doctors, lawyers, Native Americans and mountain men. The Smokin’ Guns is a sub-group of individuals who perform shootouts on the streets of Cripple Creek and Victor during staged events at local festivals. The group supports new members with advice on how to dress, mannerisms and culture, and assist with research on the people who lived in the area. They even have a lending program with wardrobe and accessories tailored to period dress. With a 20-year anniversary celebration for the society, 2019 promises to deliver with plans for participation in parades, train rides, festivals, skits, croquet, Victorian teas and dances, plus provide ambiance at events including Donkey Derby Days, Salute to American Veterans Rally, Midland Days, Victor Gold Rush Days and more. The nonprofit society also supports historic preservation efforts through the Butte Theater, District Museum, Homestead House, Lowell Thomas Museum and at local schools, to name a few, and are always looking for new venues. In conjunction with the City of Cripple Creek, the group conducts Trolley Tours every Saturday twice daily during the summer months from Memorial Day through Labor Day. Tours feature narration of the area’s history and with stops and skits, including the escape of prisoner James Bacon from the Jail Museum and an angry prostitute demanding pay from a dubious patron at the Homestead House. One of the group’s most popular events is Mt. Pisgah Speaks, Sept. 14-15, with members telling the tales of their character(s) interred at Mt. Pisgah Cemetery. 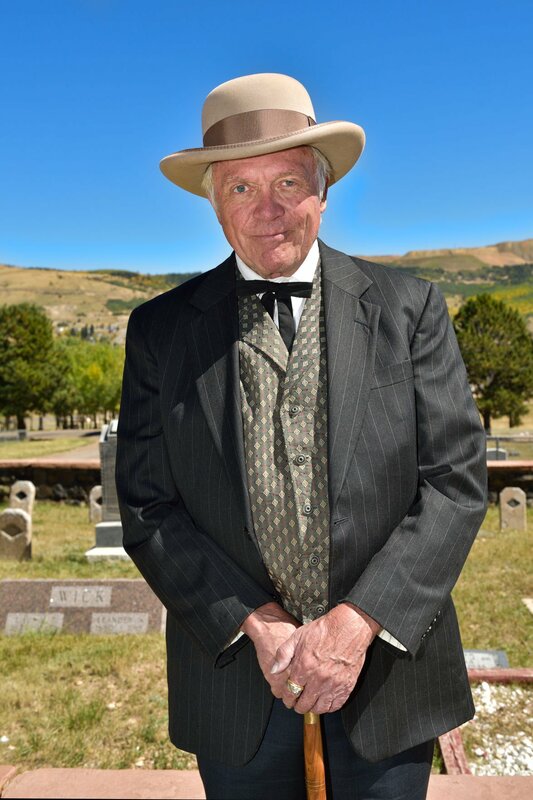 Experiencing the past through the live portrayal of historic personalities is a fun way to learn about the lives of people who were once a part of the fabric that formed the Cripple Creek and Victor Mining District during its turn-of-the-last century heyday. For more information about membership and upcoming events, visit goldcampvictoriansociety.org, call 689-0907 or approach any one of the members while dressed in Victorian or Western garb at any of the numerous outings.